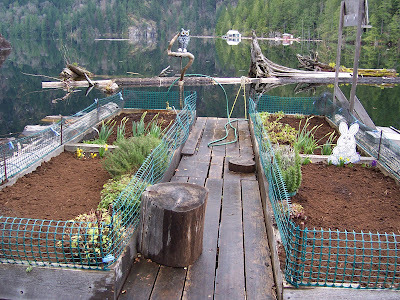 Wayne and I planted our floating garden last week. It's an Easter tradition. Early spring planting results in baby lettuce by June. It also gives us time for one summer replanting for fall veggies. We started by augmenting our soil. In Chippewa Bay we found beds of mulch leaves washed up on shore. We gathered four large tubs full along with several buckets of sand. We also got some steer manure and commercial plant food to add to the mix. I made some changes this year. I usually plant potatoes in one garden float bed. This year I only planted potatoes in my hillside garden. It has increased in size, so now it can hold quite a few potatoes. Besides, it is the only thing I can grow that the critters will leave alone. I found an excellent old pamphlet called Companion Planting and Intensive Cultivation by Nancy Lee Maffia (Rodale Press, 1989). It includes plant allies for mutual support and pest control, and enemies that shouldn't be planted together. It also covers plant space needs, succession planting and crop rotation. I learned to separate my onions and asparagus. Hopefully they will both do better. With an extra bed at my disposal, I planted more lettuce and spinach. I also tried beets for the first time. I love pickled beets in salads. My herbs and strawberries made it through the winter. I cleaned out the old leaves and put sand under the berry plants. This acts like a mulch and helps keep the berries from rotting on soggy soil. A few plants were killed by grubs in the roots so I filled in the bare spots with volunteer plants. Immediately after planting was done we covered the beds with bird netting to prevent Junco Wars from happening again. A few days after planting we had snow showers, but it didn't last long. The snow melted and sunshine re-warmed the soil. Some days it's hard to believe spring is really here. 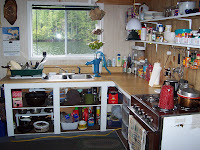 When we are at our float cabin on Powell Lake in Coastal BC we are surrounded by high peaks. Using snowshoes we are able to get to a viewpoint overlooking the lake with spectatular snowcapped mountains in the distance (Beartooth, Knuckleheads, Freda and Tin Hat). Sometimes we use our quads to get to other high viewpoints. 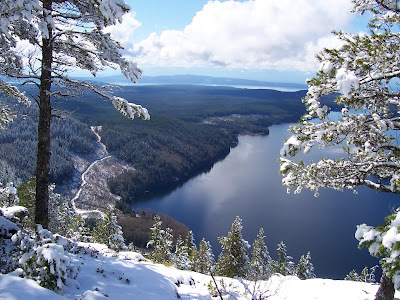 Here is one overlooking Haslam Lake with Texada Island in the background. Our good friend John likes to build trails just to get to high places like this. Trail building is hard work, but the benefits are well worth it. During winter, snow in the high country drives mountain goats to lower slopes for food and comfort. On a recent boat trip to the head of Powell Lake, we saw fourteen grazing and frolicking on rocky patches closer to lake level. Usually it takes binoculars to find goats, but this time they were visible to the naked eye. 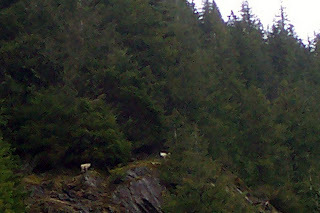 Mountain goats show up as yellowish-white dots against the dark granite outcrops. They are most evident when they leap from rock to rock, seeming to defy gravity. Two toes on each of their cloven hooves spread wide to give them greater stability and gripping power on rocky surfaces. Down below in our Bayliner, we are spellbound. Each time we pass a likely cliff we slow to see if we could find some more goats. And each time we are rewarded with several excellent specimens. I wonder if they watch us from their lofty perches, thinking we are just as interesting. It's amazing how much "junk" you can find out in the bush around Powell River in Coastal BC. As they say, one person's junk is another's treasure. Our friend John was hiking when he spied a dilapidated fence which led him to an old shake blocker's cabin. The walls were gone, but the trusty wood stove looked like it was ready to get back to work. Many logging operations left equipment behind when all the trees were harvested. Here's a winch that was used to move heavy logs down the mountain slopes. Early logging took lots of manpower and many Chinese and Japanese immigrants were part of workforce. Here are some fragments found in a logging camp dump. The Canada Geese have returned to Powell Lake. For the last two weeks we've heard their early morning calls as they take flight out of Hole in the Wall. This morning, Wayne saw a flight of about 25 birds in formation passing over our cabin and then banking in unison down First Narrows towards the lower part of Powell Lake. 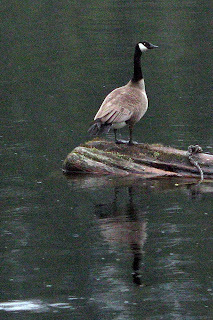 The Canada Goose makes its nest near the water's edge. The Hole in the Wall is perfect since it is calm with a shallow shoreline. Mating-pairs are known to stay together for life. Mating occurs in the spring on the water. A clutch of 2-8 eggs hatch in about a month and the chicks grow to sufficient size in 6-7 weeks to begin flying. By late summer, it is hard to distinguish the kids from their parents, except for the order of the procession on land or in the water. Often, we will see the whole brood paddle out of the Hole past our cabin. During summer, the Canada Goose goes through molting. The flight feathers that are worn out from long migratory trips are shed leaving the birds unable to fly for up to 8-10 weeks. During this flightless period they prefer areas near lakes or ponds for security from predators. When geese gather in large numbers during the molting season it can be very damaging to local vegetation, not to mention messy. Fortunately, in the Hole we usually only get one nesting pair. We enjoy their presence and look forward to Mom and Dad showing off the kids as they grow. 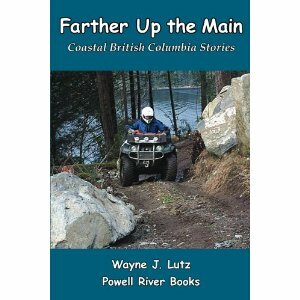 We love to ride our quads to explore the bush around Powell River. 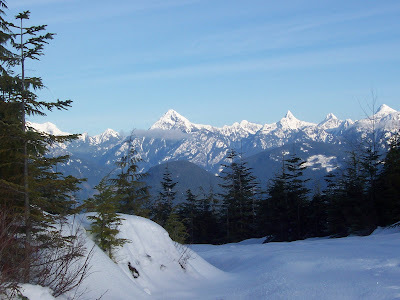 Forest service and logging roads are normally open to the public after 6:00 p.m. on weekdays and on weekends or holidays. But some areas can be closed due to active logging and some operations work seven days a week. Fortunately, most companies notify the public via notices in the local paper or postings on the roads. In Powell River, Western Forest Products has a 24-hour info line at (604) 485-3132. You can also check with the following maps before heading out. On a Saturday, we took our quads north to Theodosia. (Please note: The entrance to Theodosia is rated for more advanced riders.) Theo was once difficult to reach for the hardy pioneers who called it home. Our friend John lead us up Southview Road to the trail he built with the assistance of other ATV enthusiasts. 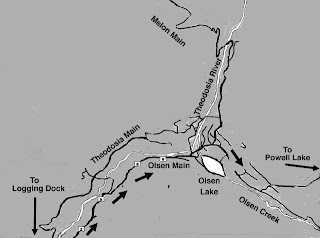 Once in the Theodosia Valley, logging roads took us to the Olsen Valley. In the 20's, there were several families with cabins in this area and enough children for a school. But in the 60's, when hippies wanted to get back to the land, the cabins were burned. That is, all but one which was today's destination. The cabin reportedly belonged to an early Powell River "millionaire" who traveled up the lake by boat and then overland by Model-T Ford. It isn't much now, but it gives you a feeling for what it was like way back when families grew produce to supply the nearby logging camps. 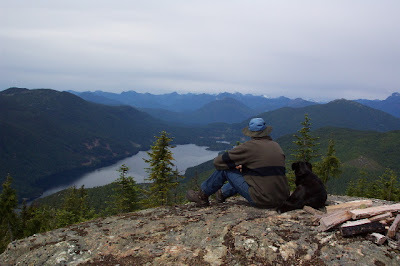 From the cabin we continued along the logging road to Olson's Landing on Powell Lake. This is the same route many before have taken to carry logs and shake blocks to the paper mill and market. That purpose and path continues today. After a lunch at the camp area next to Olsen Creek we headed back to Olsen Lake on the way home. 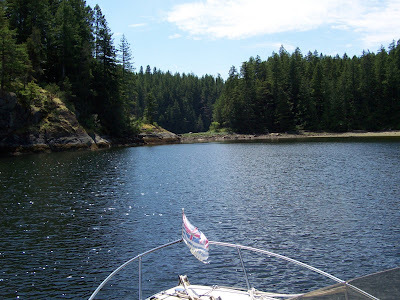 On Powell Lake there's a point off Goat Island jutting out into the water that the locals call Elvis Point. A nearby float cabin owner loves Elvis Presley. As a present, a relative gave her a life size cutout of The King which she proudly displayed on the rocky promontory behind her cabin. Each season Elvis was lovingly restored. 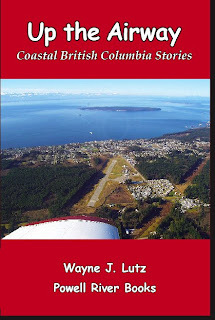 Tonight was the book launch for Up the Airway, the newest book in the Coastal BC Stories series by Wayne J. Lutz. Yes, that's my Wayne. We had lots of room in the center of the Town Centre Mall in front of Coles book store. Corinne, the manager, is one of our strongest supporters. Thanks to her efforts our books sell extremely well. Wayne gave a forty-five minute slide presentation highlighting stories and pictures from the book. The chapter "Unexpected Destinations" included tracking Musk Ox on the tundra near Cambridge Bay and unique Anglemont Airport with its extremely steep runway. 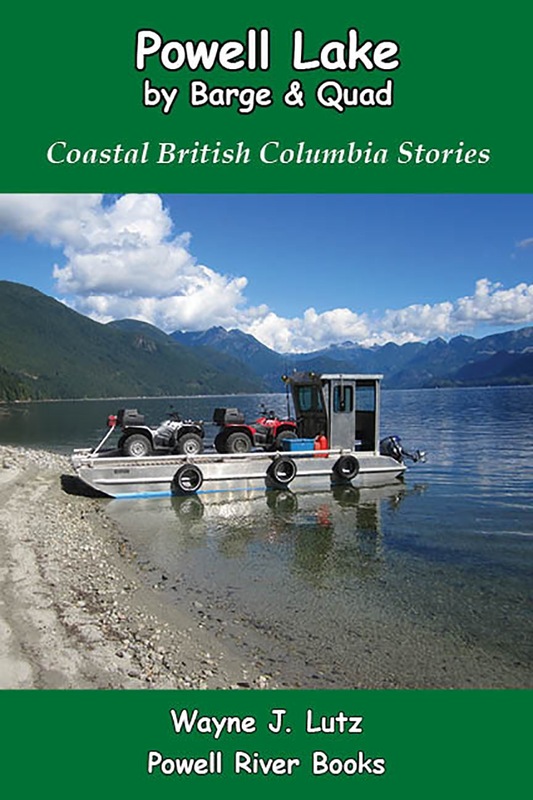 Local destinations such as Courtney, Hope, the Gulf Islands and Alert Bay were a hit with the local crowd. Maybe you think I'm talking about a big, yellow, ferocious cougar. They do inhabit our area, but no, a Hole in the Wall Mountain Cat is a lot smaller, black, furry (especially in winter), and short tailed. It's not ferocious, unless you don't get his can of salmon open quick enough at dinner time. Of course I'm talking about Stick Tail, our cat. Stick started life as a city cat near Los Angeles then moved north as we did. Now he comes up to our float cabin. On his first and second visits he was quite the fraidy cat, but he did venture out on the float and even underneath to see if there were any mousies down there. Right now the lake level is very low allowing several floating logs to touch shore. Stick was uncharacteristically brave and leaped over the water to reach one of those logs. He then scampered to little beach that's now exposed. We felt fairly confident he wouldn't leave that gravel shelf, but to our shock and horror he started climbing narrow ledges up the rock wall. Now mind you, this wall is about 100 feet high and leads to an inaccessible forested area. If Stick went up, there would be no way to reach him. What should we do? While we were thinking, Stick scrambled up a vertical section of rock about five feet high. You could hear his nails grappling for a hold, but he made it. To reward himself, he stopped to eat some grass. Wayne got some rocks to throw against the cliff above his perch. On about the fifth throw, one hit the mark. Stick turned tail, ran down the cliff, over the beach, across the log, leaped over the water and zipped up to the cabin door. Once he was inside I don't know who was more relieved, Stick or us. Halcyon is defined as tranquil, happy, idyllic, and, as in the phrase halcyon days, usually with nostalgic reference to earlier times. When we go cruising on the chuck (ocean) we use our 24' Bayliner named Halcyon Days. 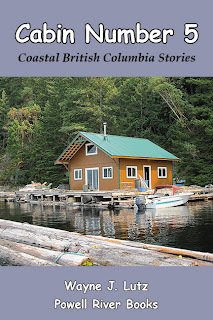 She takes us to tranquil anchorages in idyllic settings on the Strait of Georgia along the British Columbia Coast. 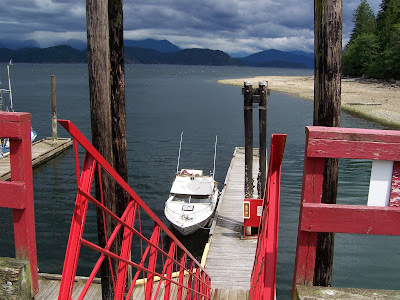 Here she is on a blustery day at the Squirrel Cove dock on Cortez Island. After a rough crossing we were happy to tie up. Later we anchored in the nearby protected cove for a peaceful night. 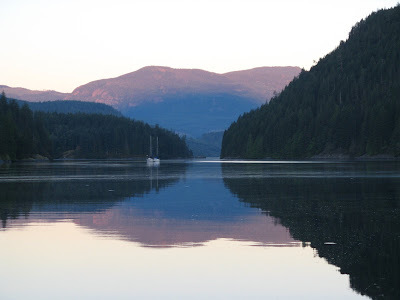 This pocket cove in Theodosia Inlet is my favourite anchorage. 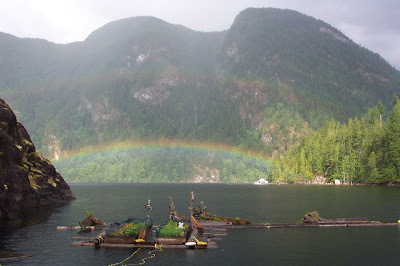 Few tourists come here even though it is right next door to the very popular Desolation Sound. This time of year I start working in my vegetable garden. It's unique as gardens go. It's a floating garden. Our friend John designed and built it for me to float alongside our cabin on Powell Lake in Coastal BC. Cedar logs were lashed together to create the float. Because dirt is heavy, several 55 gallon blue barrels were strategically placed underneath and filled with air to provide extra buoyancy. Then four raised beds were constructed and placed on top. Each bed is four feet wide and ten feet long. Because we live in Coastal BC, our winters are fairly mild. My strawberries, asparagus and herbs have always survived through the snow and frost. Here is my garden just after spring planting. Summer is the prime season for my garden. 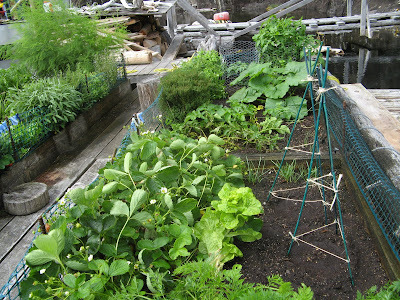 Even though the space is limited, I have potatoes, onions, carrots, radishes, spinach, zucchini and several types of lettuce. This is in addition to my annual asparagus, strawberries and herbs. Each year I rotate my crops and replenish my soil, but I have to be very careful to protect the water on which it floats. It also serves as our drinking water. Last year I was honored to have my garden highlighted on Sunset Magazine's website. Click here to see it for yourself. 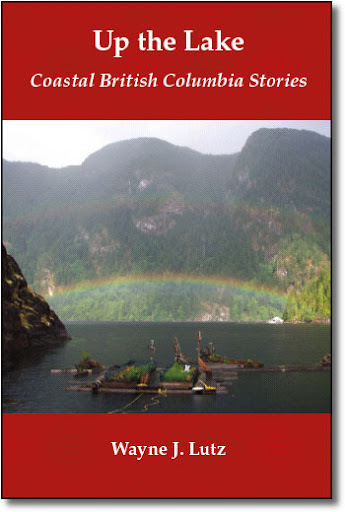 The Coastal BC Stories series has grown over the last three years to five titles. Each one looks at the region from a different perspective. Up the Airway is the newest book in the series. Fly across Canada to see our beautiful country from the air and then land to camp at remote strips. In addition to BC, travel to the Arctic Ocean, Hudson Bay, Canadian prairies and Pacific Northwest for a unique travel experience. Even if you don't fly, many of the locations mentioned in the book can be reached by public transportation or car. Come fly with us "up the airway" to some unique destinations. I love to cook, especially at my float cabin. Our kitchen is compact but functional. It's plenty of room for one, but two makes a crowd. On one wall you will find my sink and shelves to store my pots and pans. The window has a great view of the entrance into the Hole in the Wall. 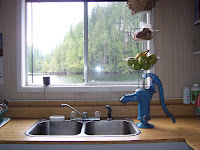 With a view like that, you almost don't mind doing dishes. 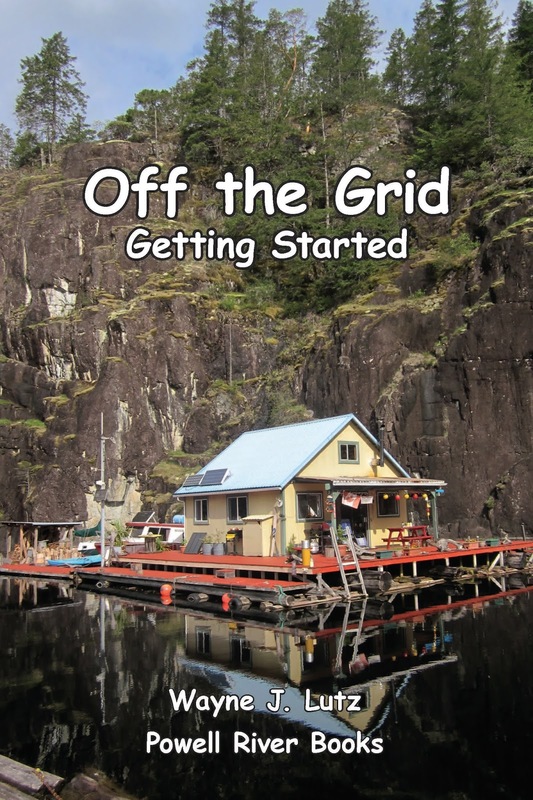 When John built our cabin he installed a hand pump. It draws water from about six feet below the lake surface. To be safe, we boil it before drinking. Continue around the L-shaped counter and there is my small stove. Open wall shelves hold our dishes and food. Under the counter is are two plastic drawer units. To deter mice, we keep foodstuffs in containers, especially when we aren't there. We've been very lucky so far. Tucked under the stairs to loft is a small refrigerator. It even has a freezer which really comes in handy during the summer for ice to make ice cream. 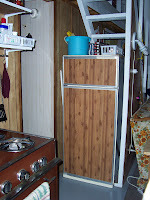 Both the stove and refrigerator run on propane. Along with propane lights, a 60 lb. tank lasts about six weeks for $54. We have to haul the tanks to town in our boat, but once every six weeks isn't too bad.